The last time it was on Fort Meade, the 314th Infantry Regiment's cabin probably sat somewhere on the old golf course. But when it came back to the installation last fall after decades at Valley Forge, Pa., the structure resembled a pile of Lincoln Logs. 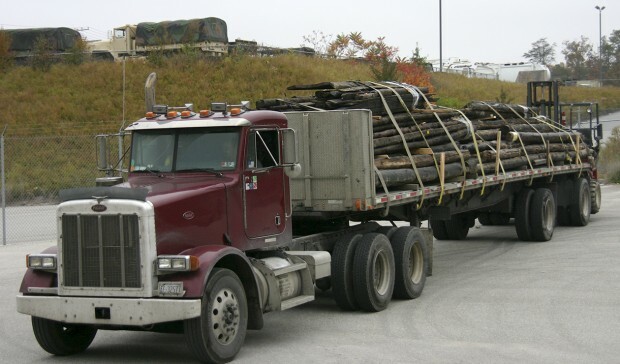 The century-old cabin was transported in pieces to Fort Meade beginning Oct. 26, with the final logs dropped off on Nov. 2. The disassembled cabin will be rebuilt near the Fort Meade Museum and used as a community activity center for the Directorate of Family and Morale, Welfare and Recreation. Through the Descendants and Friends of the 314th, the Washington Memorial Chapel in Valley Forge gifted the cabin to Fort Meade. "It is now going to be returned to an active-duty post," said Barbara Taylor, Fort Meade Museum exhibits specialist. "It is a veteran coming home to do service for active duty." Initially built in 1917 by the Soldiers of the 314th Infantry Regiment of the 79th Division American Expeditionary Forces, the cabin was constructed using trees from the forest that surrounded the post, then known as Camp Meade. With construction material scarce in the desolate camp, spikes were hammered out of horseshoes and door hinges were shaped from wagon tires. While the exact location of the cabin's original site is unknown, it is believed -- based on old maps and photos -- that the cabin was built on what later became the Courses. "[The Directorate of Public Works] took a map of everything we have today and overlaid a map from 1917 over it, and then they looked for where the building would be," said Chris Thiel, chief of training for the Directorate of Plans, Training, Mobilization and Security. "One of the 314th Infantry association members brought us a big unit picture and it looks like it was right in front of the chow hall. So we were able to identify that and some of the other buildings around it, and we think we have it pinpointed where it was." Before the 314th was deployed during World War I to France in 1918, the cabin served as an officers club and assembly hall for the members of the unit trained at Camp Meade. In France, the Soldiers were heavily involved in the Meuse Argonne Offensive and remained in Europe until Armistice Day on Nov. 11, 1918. Soldiers returned home in May 1919 and were discharged. Shortly after the war ended, the cabin was transported, log by log and stone by stone, to Valley Forge by rail. It was rebuilt on top of a hill and dedicated on Sept. 30, 1922 as a memorial for the Soldiers who lost their lives in Argonne. John Shetler, president of the Descendants and Friends of the 314th Infantry, said that for several years the third generation of the organization was looking for a new location to preserve the cabin. Initially, the cabin was going to be part of the Carlisle Barracks' Army Heritage Trail in Pennsylvania. But when the plan fell through, Fort Meade came into the picture as its new home. The process to move the cabin to Fort Meade began three years ago after Taylor met Shetler at a World War I seminar. "Their descendants would like to see the cabin returned to Fort Meade," Thiel said. "It's kind of returning it to where it came from." The cabin was then disassembled and moved to Fort Meade by truck at no charge to the installation. It is currently being stored in a warehouse. The goal is to have the facility reconstructed by the summer. Shetler said that the group hopes to make a trip to Fort Meade once the cabin is fully reconstructed. "We would love to see it," he said. In addition to the log cabin, the 314th's collection of artifacts, which were stored in the cabin at Valley Forge, were given to the installation. The large collection contains enemy machine guns, war artifacts, trench art and photographs. Most of the materials will be conserved and displayed in the Fort Meade Museum, but some will be placed back in the cabin. "We have a few artifacts that can withstand cabin environment because it's not going to be humidity controlled," Taylor said. "Certain artifacts that wouldn't be affected by humidity, like some wrought iron, original lamp fixtures, those are all going to stay with the cabin." With the cabin and artifacts now in possession of Fort Meade, the museum staff is eager to get the materials sorted and the cabin erected. "I can hardly stand it I'm so excited," Taylor said. 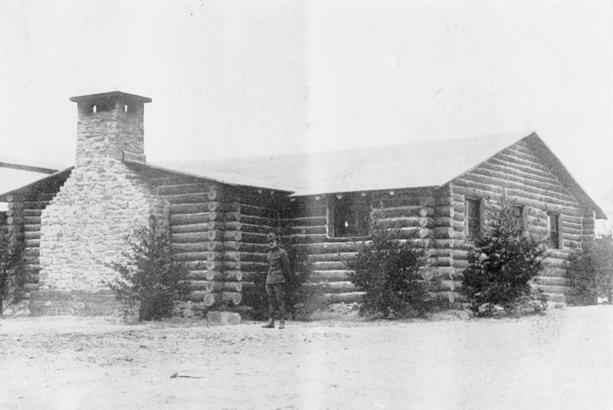 An officer stands outside the 314th Infantry Regiment's cabin at Camp Meade in 1918. November 2012 and will be reconstructed to serve as a community activity center.